The dependency of people on groundwater has increased in the past few decades due to tremendous increase in crop production, population and industrialization. Groundwater is the main source of irrigation in Shiwaliks of Punjab. In the present study the samples were collected from predetermined location as was located on satellite image on basis of spectral reflectance. Global positioning system was used to collect samples from specific locations. Principal components analysis (PCA) together with other factor analysis procedures consolidate a large number of observed variables into a smaller number of factors that can be more readily interpreted. In the present study, concentrations of different constituents were correlated based on underlying physical and chemical processes such as dissociation, ion exchange, weathering or carbonate equilibrium reactions. The PCA produced six significant components that explained 78% of the cumulative variance. The concentration of the few trace metals was found to be much higher indicating recharge due to precipitation as main transport mechanism of transport of heavy metals in groundwater which is also confirmed by PCA. 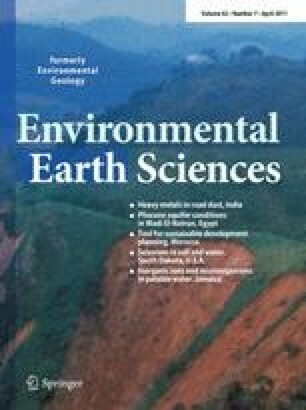 Piper and other graphical methods were used to identify geochemical facies of groundwater samples and geochemical processes occurring in study area. The water in the study area has temporary hardness and is mainly of Ca–Mg–HCO3 type. The author (C.K.S.) thanks Satpal Mittal Trust for providing financial support to carry out the research work and P.N. Singh of CGWB, Ministry of Water Resources, for his help, valuable suggestions and encouragement.